...as it's time for our yearly trip to New Zealand. How young Hugo will cope with 26 hours of flying is anyone's guess. He's now 12 weeks and a bit more predictable than he used to be, but it's going to be an experience...We are not venturing far this time - a few days in Auckland before heading down to Tauranga to introduce Hugo to his Kiwi grandparents, aunts and uncles. After a week or so we will hea back up north to spend a few days by ourselves around the Bay of Islands. It's apparently been a record summer in NZ so far - I hope the good weather lasts a couple of weeks longer. A couple of wip pics are above. 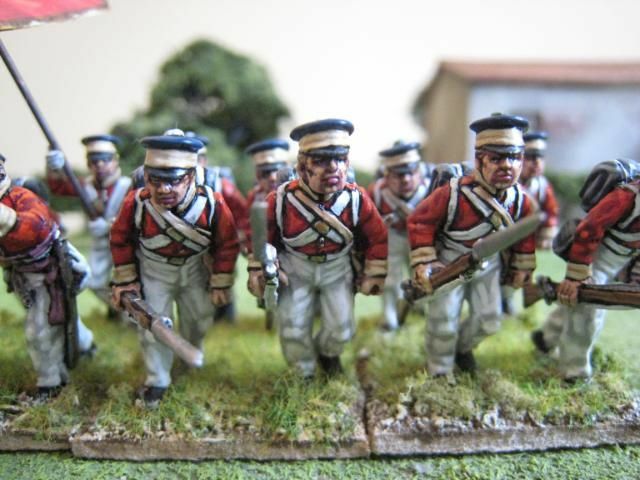 The 1st battalion of the Armagnac regiment is coming along nicely and over the weekend I managed to squeeze in 8 "revolting slaves", newly released by North Star Miniatures. 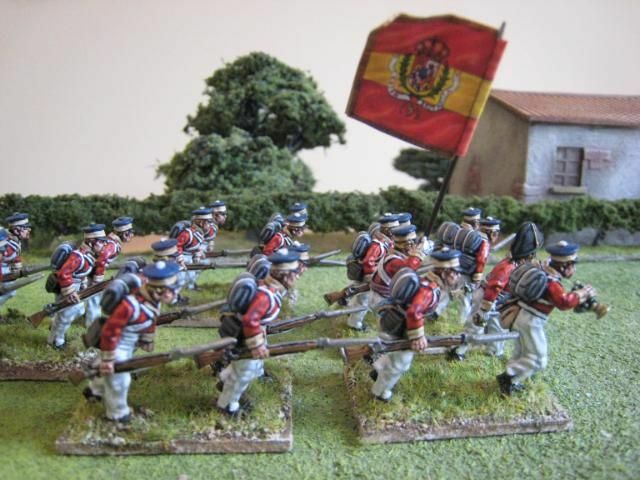 I've finished basing a few other things and have just received a boxload of Spanish houses from Paul Darnell of Touching History to go with my First Carlist War collection. So lots to post about when I return. Major-General Werner von Mirbach's regiment was in the first wave of Hessian troops to arrive in America and its experience followed the template for regiments in Howe's northern theatre army: Long Island, White Plains, Brandywine, Germantown, Fort Mercer, Monmouth and then garrison duty in New York. This list, however, illustrates how presence on a battlefield does not necessarily reflect active engagement. In his seminal work "The Hessians", Rodney Atwood uses von Mirbach's regiment as an example of how most Hessian regiments did very little fighting - apparently the regiment only saw action for the 40 minutes of the attack on Fort Mercer (in which it lost its colonel and 95 other soldiers dead and wounded). In other battles the regiment was a spectator, and this experience was common among the Hessian regiments in America. There were exceptions of course, notably the jaeger and grenadier battalions, and the Von Bose musketeers in the southern campaigns. 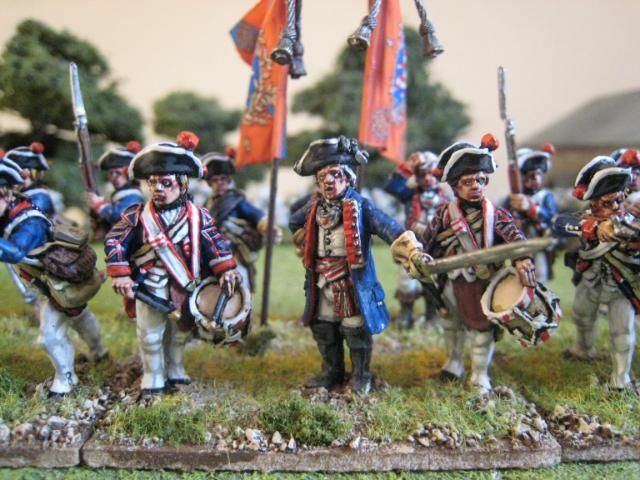 But many Hessian regiments appear in scenario orbats and so they need to be modelled, even if on the tabletop the Hessians often appear late in the day and add little to the British side. 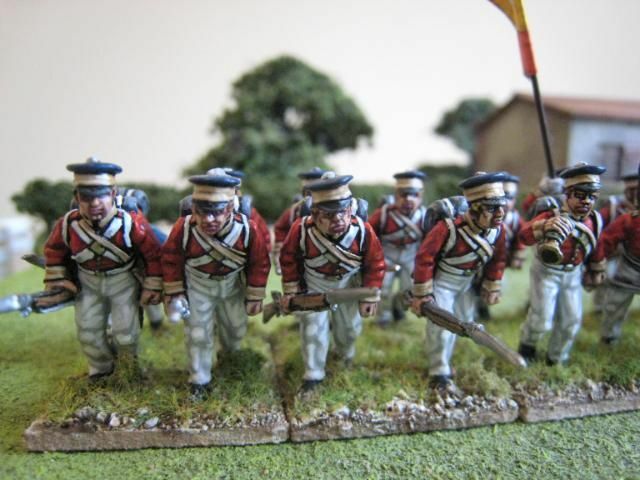 In the various "British Grenadier!" 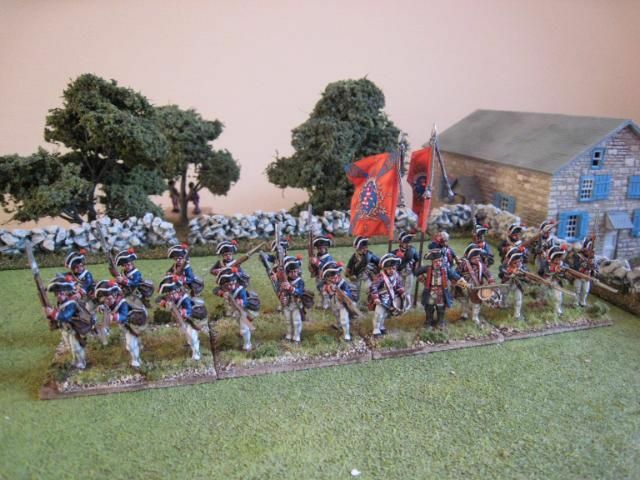 scenarios Von Mirbach are present at Long Island, Brandywine and Germantown, all in units of 24 figures. 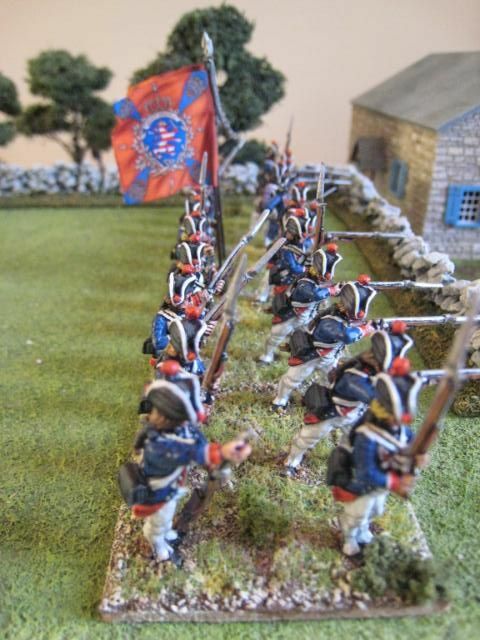 I recall commanding Stirn's Hessian brigade in the Knyphausen sector of Brandywine at the large National Army Museum game a few years ago - the brigade didn't arrive until the second day of play and by the time I moved them across the river the Americans were already well into their withdrawal. 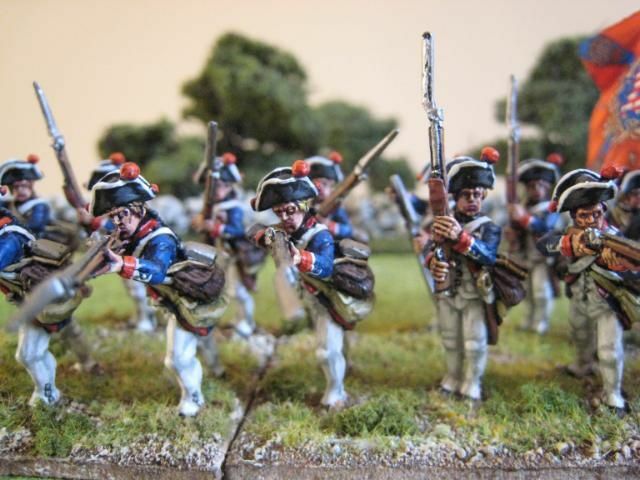 I've already painted the Perry Miniatures marching and charging Hessian musketeers, so the firing figures were next on the list. I confess that I found these tricky to paint. Some of the faces lacked a bit of definition and the poses make it tricky to reach some of the torso areas. I corrected a couple of things I didn't do properly when I painted the Von Mirbach grenadier company for Von Linsing's battalion - here, the officers' lace is silver and I added white piping around the cuff buttons. The hat pompoms are red, although I have seen others paint them dark blue. 24 figures. Painted January-February 2010. Flags by GMB. 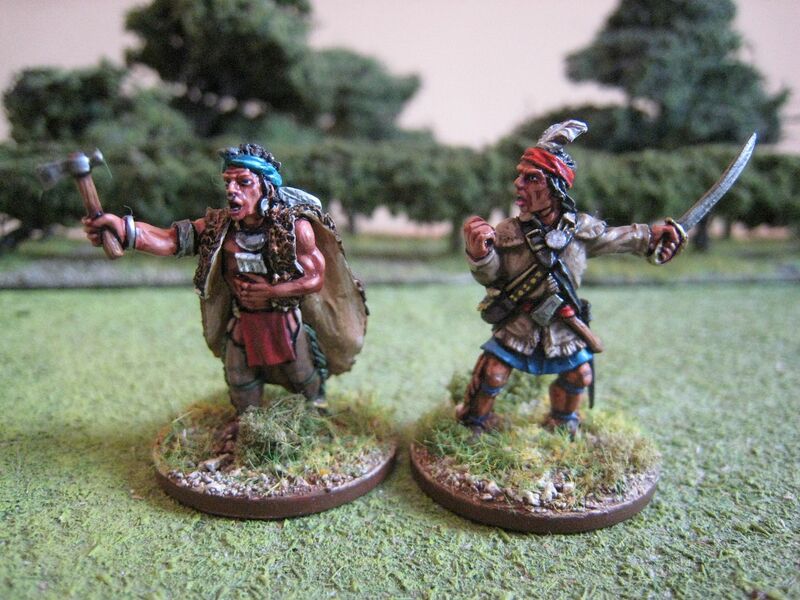 These are the Conquest Miniatures "personality" figures of Tecumseh (1768-1813) and his brother Tenskwatawa (1775-1836). 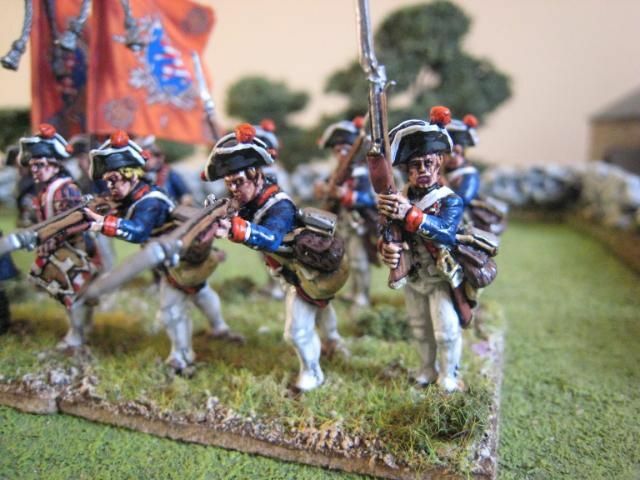 As historical persons these two are out of period, but the sculpts themselves seem perfectly suitable for the AWI and I intend to use them as generic chief/leader figures (hence the round bases rather than 25mm squares). I bought these figures in the UK from North Star Miniatures. 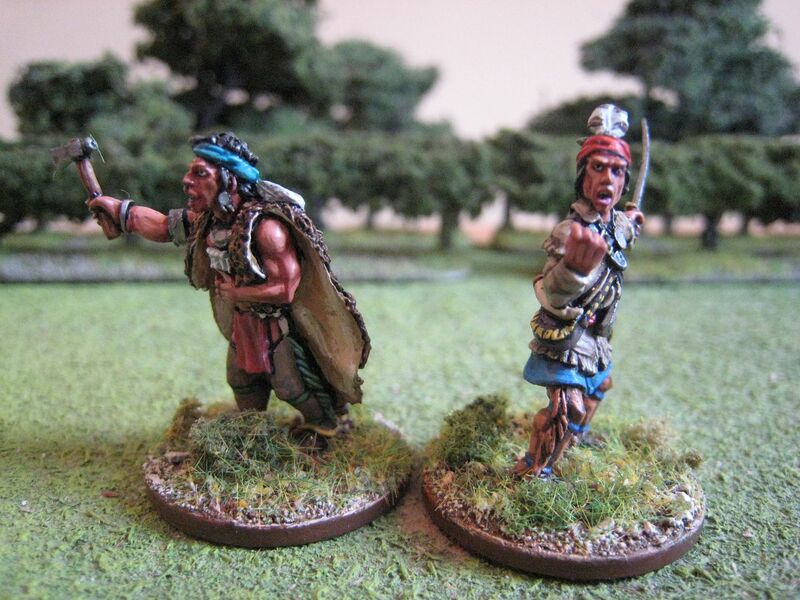 Conquest's figures are a good match for Perry Miniatures indians but are a fair bit slimmer, as the photo on the right shows. Tecumseh was chief of the Shawnee tribe and is of course famous for his role in Tecumseh's War and the War of 1812. Tenskwatawa, also known as "the Prophet" was a religious leader who believed in a return to the indians old ways and lifestyles. Their tribe lived in Ohio, Kentucky and Western Virginia and fought on various sides during the 18th century. Red Jacket was a Shawnee chief - he advocated support for the British in the AWI. Increasing pressure on the indians' homelands in Ohio led to the various tribes forming confederations to offer better resistance to white settlers. The Shawnee took part in Little Turtle's War (1785 to 1795). After initial successes, the confederacy was defeated by forces under "Mad" Anthony Wayne at the Battle of Fallen Timbers. As a result, large parts of the Ohio territory were ceded to the US. The Treaty of Fort Wayne in 1809 saw further territory turned over to white settlers. Tecumseh, by this point the chief of the Shawnee, immediately advocated opposition to the treaty and encouraged resistance. Discussions with the governor of Indiana came to nothing and fighting broke out in 1811. An indian force under Tenskwatawa was defeated at the Battle of Tippicanoe in November. Tecumseh rallied his confederation and joined in the British attack on Detroit the following year. Tecumseh and his force remained on operations with the British in Canada under the chief was killed at the Battle of the Thames on 5 October 1813. The indian confederacy dissolved in the wake of Tecumseh's death. Tenskwatawa survived the Battle of the Thames and took many of the Shawnee to a new home on the site of present day Kansas City. He apparently had 20 children by 3 wives. These figures were painted with another of the new Foundry flesh palettes, "Native American Flesh 120". I have never before bothered to paint native Americans any differently to "white" Americans, but I think this palette works reasonably well. Again, perhaps another highlight or two would be handy on large areas of flesh, but the paints give a nice darker hue to the overall look and I'm tempted to use these paints in the future on more indians. 2 figures. Painted February 2010. I had not intended to paint more BAL infantry so soon, but I received these figures for Christmas and so I thought I'd just jump straight in. I like these "running at trail" poses as they are quite easy to paint and look dynamic. Michael Perry clearly enjoys sculpting figures this way, as there are other running-at-trail figures in his Sudan range. 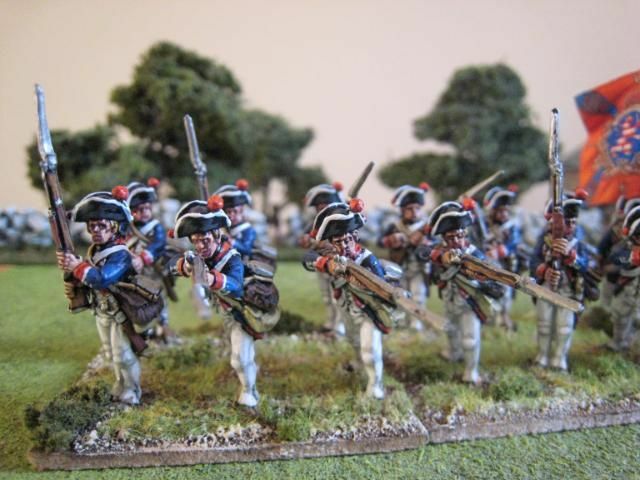 Basing them is a bit of a pain, as the figures have to be angled in such a way as to ensure that the muskets are not sticking into the figures in front. That said, I used the same sized bases as usual for the FCW and I don't think these look too crowded. As with the 10th battalion I used one of the Adolfo Ramos flags for the 3rd battalion and painted over the number to add a "7". The 7th completes the BAL's "Irish Brigade" in my collection. 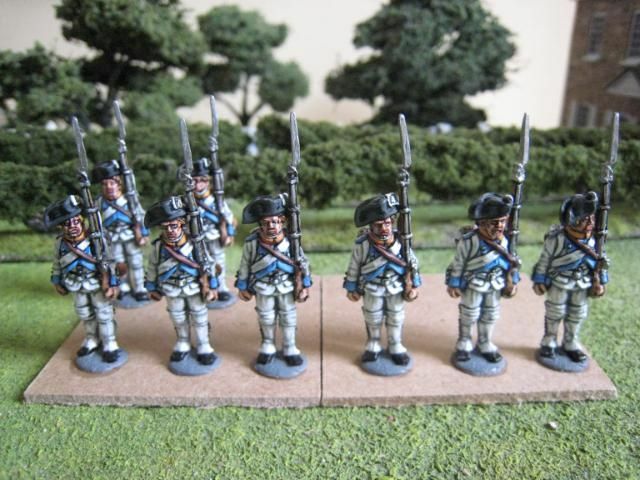 I gave these figures the white summer trousers as a bit of a change from the Oxford blue and campaign dress looks I used for the 9th and 10th battalions and also because there is one specific reference to the 7th in white trousers, at the battle of Ayete (see below). Some sources refer to all the Irish regiments having a green cap band, but I'm not convinced by this and simply decided to use the facing colour of each battalion. 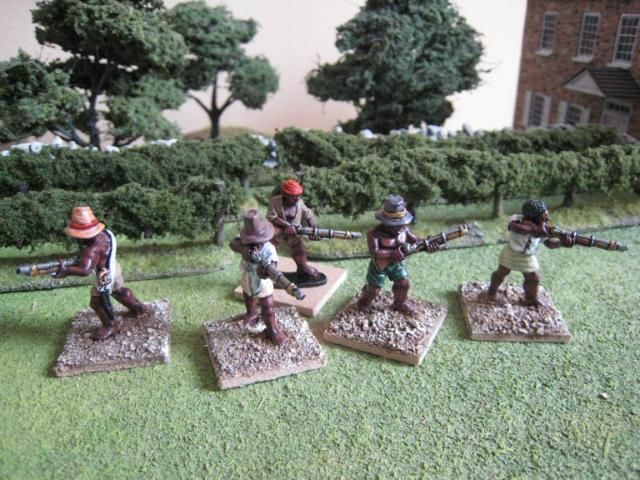 The 7th was named "the Irish Light Infantry" and so I gave the unit a bugler figure rather than a drummer. As I've noted before, the BAL suffered dreadfully from sickness during its stay in Vitoria during the winter of 1835/6 (losses were so great that two battalions were disbanded). In the spring the Legion left Vitoria to march towards Santander and the coast. Eyewitnesses reported most favourably on the appearance of the Irish Brigade, whose soldiers seem to have best endured the hardships of winter and typhus. From Santander the Legion was taken by sea to San Sebastian with the intention of launching attacks on the Carlists' positions outside the town. The Carlists lacked the strength (and navy) to effectively besiege San Sebastian, but their presence tied down the Isabelino troops inside the town and for that reason the Crown needed the Carlists removed. So came about the battle of Ayete on 5 May 1836, the Legion's first major engagement and also its bloodiest. On the evening before the battle, Brigadier Charles Shaw, the commander of the Irish Brigade, wrote of his concerns about frontally assaulting entrenchments with untried troops. The Legion attacked the first line of positions at dawn, with orders not to fire but simply to charge with the bayonet. Many units failed to do this, being distracted by the amount of fire poured on them, but it was noted that the 7th obyed these orders and closed with the enemy very quickly. The fighting over the second line of Carlist defences was particularly bitter. 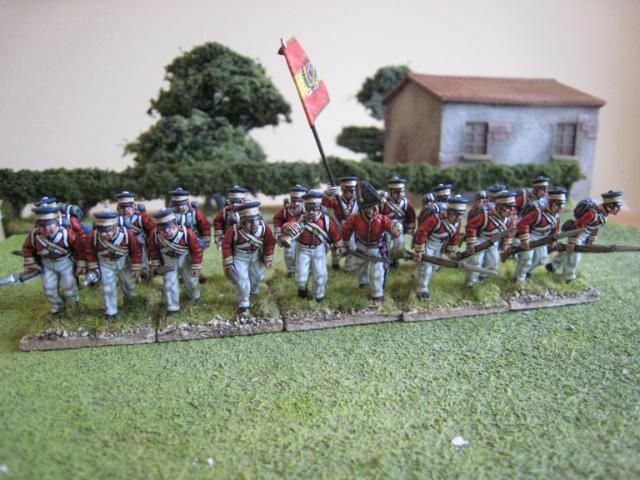 The 7th and 9th battalions charged and were repulsed 3 times. Then the 10th managed to catch up with them the brigade's officers started to lead a new attack. Colonel Charles Fitzgerald of the 9th rallied the brigade with these words: "Irishmen! Tenth, Ninth, Seventh; Munster boys, bog-trotters, ragamuffins, come on with ould Charlie - I'll stand here by myself till I'm shot, if ye don't come." These words had the required effect and the second line was taken. The Carlists' next position, the fort of Lugariz, was carried by the 4th and 8th battalions and a Royal Marine battalion, which had just arrived by boat and which were supported by a well-aimed bombardment by the Royal Navy ships anchored off San Sebastian. By the close of the battle, the Irish Brigade had lost 27 officers and some 400 men. The Legion's losses were so heavy that The Times newspaper accused the BAL's commander, General Evans, of making "a Bunker Hill display". 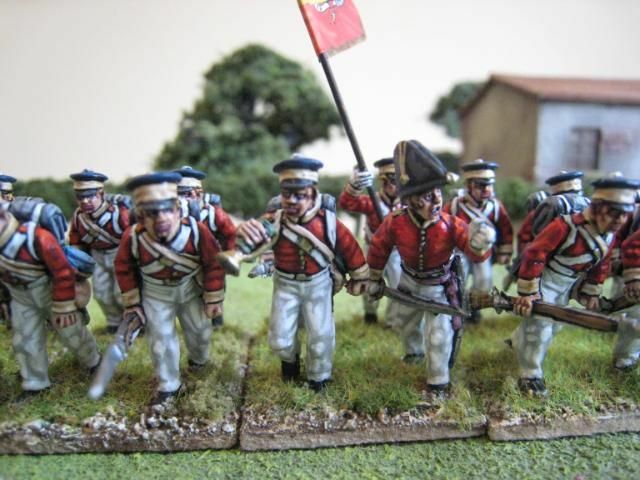 However, the Legion had acquitted itself very well and delivered an impressive victory to its Spanish paymasters. 20 figures. Painted January 2010.